Directors know if they are fulfilling their governance responsibilities. 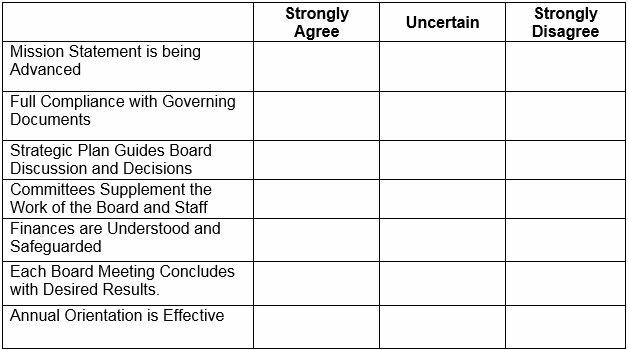 Given a board self-evaluation form, how would they check off the boxes? Every director starts their term intending to do a good job. For success, they need access to information and orientation. Board training is recommended annually, even for directors continuing their terms. It is an opportunity to “refresh and blend” the team. Let the minutes reflect that an orientation was conducted and the documents provided. This might benefit the association if there is a question about fulfilling fiduciary duties, the principle of volunteer immunity, or a legal challenge. Disclose everything expected of directors. Create a guide to board expectations listing the responsibilities beyond what is described in bylaws. If directors are not fully engaged, it could be that nobody told them. Disclosing expectations is part of the nominating or on-boarding processes. What reasons cause directors to underperform, miss meetings, fail to take on added responsibilities, or not be a good team player? The cause might be outside distractions. Their work or family might be drawing them away from board responsibilities. Or they have lost interest in volunteering. Maybe they didn’t realized the extent of the commitment. Underperforming directors often know the problem but not the remedy. Chances are the rest of the board senses the issue. 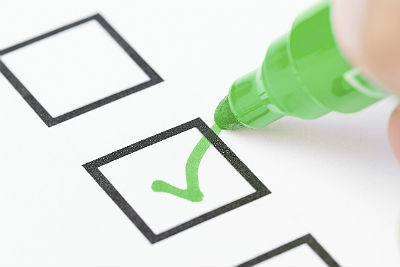 Use a self-evaluation form to help them realize their duties and to assess how they are performing. A director who cannot check the boxes may want to have a discussion with the officers or executive director about improving or serving in a different capacity. 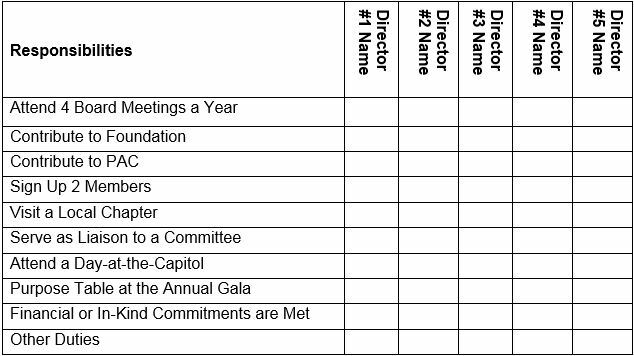 Create a grid of director duties and expectations. Another method of improving performance is to evaluate the whole board as a team. Use this for a group discussion. The intent is to identify methods to improve governance. Sometimes small suggestions have big impact. For example, one group decided serving lunch was a distraction at meetings. Another board recommended any persons giving reports should provide them in advance rather than having guests sit through the meeting. The form is usually a page or two. The board chair or a governance committee should lead the discussion. The evaluation process identifies strengths and weaknesses. It starts the conversation. If weaknesses are identified, corrective actions should be discussed.